Currently, I'm working on a large piece, which I expect to be about 35 by 24 in size, that is inspired by a photo image based on a model and artist's clothing line with a very edgy and gothic style within the heavy metal scene. What she does with her work is nothing short of incredible and visceral. And for a long time, ever since seeing that image, I decided to dive in and do something about it in order to tell a story of that photograph. And so, it is being worked on at the moment using Manga Studio 5 which I love using the inking engine on for its fluidity and customizability. I won't reveal who she is or the inspiring photo from her website, but I will leave this preview of what's to come to pique some curiosity. Dark art project on Manga Studio 5. On other bits of news, I have recently bought a new game for the PS-3 called "Dragon's Crown" last week after reading some excellent reviews of it. Note that I should warn when clicking on Dragon's Crown link, it will take you to the site that takes some time to load so don't be surprised when music starts playing in the background. When I first heard of this game and the name Vanillaware came up, it conjured memories of playing "Muramasa: The Demon Blade" for the Wii. Muramasa is one of their best works I've seen in years with beautiful hand drawn animation and many other elements going on in the background. It's an incredible game. And when one hears Vanillaware, quality comes to mind. Dragon's Crown was supposed to come out some time ago but experienced some delays until this developer picked it up to completion. And I can say that I'm very glad they did. This game was apparently inspired by Dungeons & Dragons: Tower of Doom by Capcom which is an obscure classic. I remember playing this years ago at the Coliseum arcade next to the bowling alley in Cleveland. 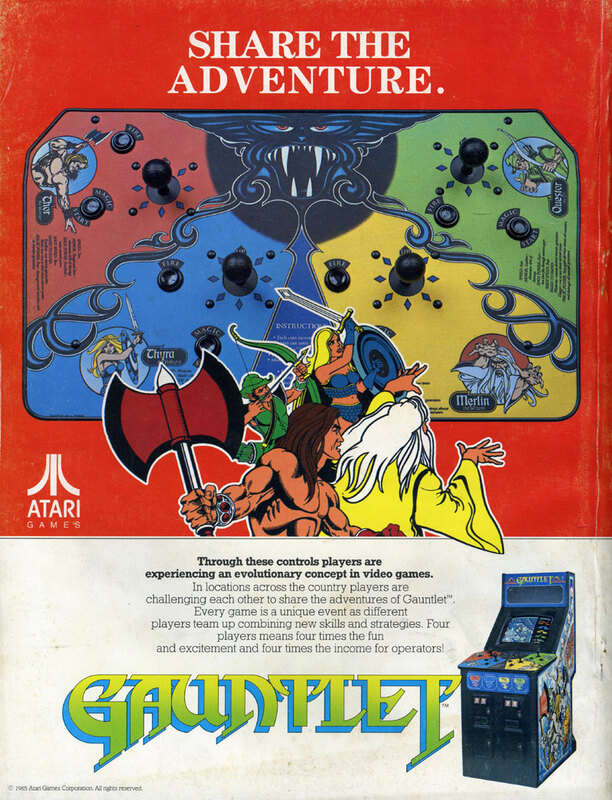 Especially, one of the most famous arcade games from the 1980s titled "Gauntlet" came to mind as well. Such memories of these games. Gauntlet was so hot at a time when Dungeons & Dragons was the preeminent game of that era in a niche industry. I will never forget the first time how I was dwarfed by the immense size of the Gauntlet cabinet and playing the Elf, popping quarters in to continue surviving the dungeons. It was a revolutionary game thanks to Atari who did a masterful job of it. And this was long before the gaming consoles killed off the arcade scene. Those were good times. And it is definitely intentional by Vanillaware to go old school in terms of game play. Dragon's Crown can best be summed up as a 2-D side scrolling version of Gauntlet, where instead of being a lone player, one can build up a party of four characters who are NPCs you meet along the way, or by ressurrecting their dead bones to life should you come across one. Dragon's Crown is not so different from Gauntlet concerning character classes since the player can be a Knight, Amazon, Sorceror, Archer, Dwarf and Mage. Betwen 1 to 4 players can join in Dragon's Crown 'locally' with controllers hooked up, or the players online can join him/her, but as long as the character reaches Level 9, then this online capacity will be unlocked, considering from what I heard. Classic Gauntlet ( 1985 ) in a top down perspective. One can see the Barbarian at the bottom. 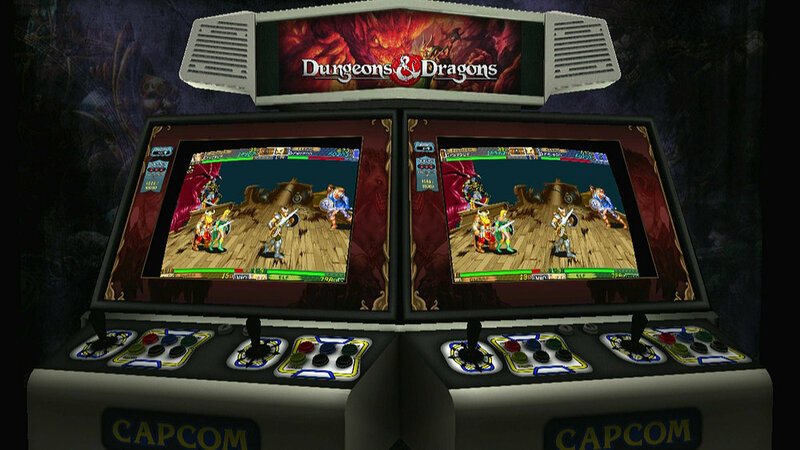 Classic D&D arcade ( 1993 ) by Capcom. One can see the influence for Dragon's Crown.There is one other character in Dragon's Crown that the player has little control of and that is the Thief, who follows the band around. Just like the famous Thief class from the D&D RPGs, he can be ordered to open locks for treasure chests, doors, and undo traps ( I think but so far I have not come across that, yet ). He looks and darts about like a young'un waiting to pick up gold or treasure into the bag. Thief is opening the lock when instructed by the player or leader.Some times, when crates or items break, food is revealed and characters intelligently go to pick them up and eat in order to heal their HP ( meaning Hit Points to those who are versed in RPG-speak ). Even weapons found on the ground, they will pick them up if they want to without being directed to which was a cool touch. In one instance, there was a huge crossbow and my party was about to enter another door when the Amazon decided to turn around, run back and pick up the weapon. I was like, "Way to go! Lock and load!". The fight scenes can be pretty chaotic when allies in your party beat the holy hell out of the creatures or enemies. And I do mean they BEAT. THE. HOLY. HELL. out of them. Especially that Amazon with her axe. The elven archer, on the other hand, along with the magic users, cannot get in close quarters, taking in too much damage. So they have to stay out of the way and fire. Their magic is extremely handy especially when dealing with bosses, so I recommend them. The Archers tend to be one of the more graceful when jumping in the air and shooting arrows in the same time "Legolas-style". It's a beautiful sight to behold. Throughout the game, the narrator ( voice over ) describes each scene or mission of what's going on, especially explaining the story as it unfolds is a great touch as if it's one giant reading book. Or manga, if you will, due to the highly stylized art involved here. 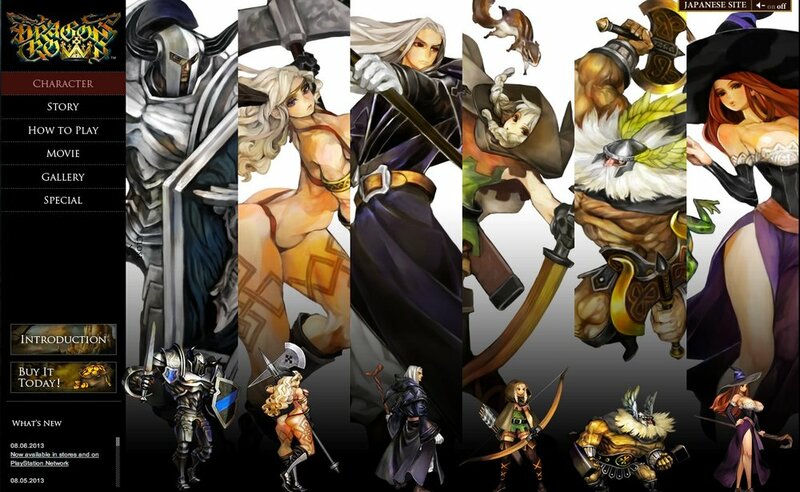 Japanese version of Dragon's Crown where characters can be customized. This is the Amazon. Two words: Don't mess. Close up shot of the actual game screen. Amazon is fighting the Lizardmen. Class and Commoner skills in a tarot card set up very similar to Skyrim.Skills can be bought based on the character's class and common skills for all of. Two cards will be shown and the player can choose one of the two to purchase skills. The more powerful or specialized the skill is, the more expensive and requiring high levels to acquire them. The tarot card set up is a nice touch and reminds me somewhat of Elder Scrolls: Skyrim where a horoscope is used instead. In this screen sample, there are THREE archers in the party including the Thief seen carrying a bag of goodies.There's too much ground to cover here but I will say that the graphics are astounding with the hand drawn animations of these characters as they're a lot of fun to watch when traversing in the dungeons or places of danger. The game is a lot deeper than I expected as I don't wish to reveal the storyline here. The background scenery is incredible with hand painted approaches as screenshots don't do it justice. Players can change up equipment on the character with magic items, weapons, accessories and the like. The resurrection sequence at the Temple has this nice barogue inspired imagery of cherubs surrounded by banners with Latin inscriptions while the priest did his voice over incantations. I loved that. But the drawback is that if one of your party members die and lose all their life points, they're gone forever. This is why I suggest saving some of the bones players come across as future members to ressurect. Players can decide not to and bury them through the Temple's services, making room for the roster or have no need for the bones. Astute players with a trained eye for art or medieval history will pick up some of the inspirations based on the renaissance/barogue/dark ages ( and sometimes Romanized ) stylization that the developers were going for and it looks like they did their research. Barogue inspired scene when characters are resurrected at the temple.And without going on for an eternity, I will say that this is one of the best looking games I've ever owned besides Skyrim for a good old fashioned fun. If players grew up loving the old school 1st and 2nd Edition Dungeons & Dragons RPGs, then they will feel at home with this game, and it's even more true when having played Gauntlet adds to that experience and sense of nostalgia. I highly recommend Dragon's Crown, exclusive for Playstation 3, for old school gamers and those who appreciate great game design and art. Grab a copy of it because it will become a rare classic like Ogre Battle by Square Enix. Dragon's Crown is a work of art.